Sunshine and some clouds. High near 60F. Winds WSW at 5 to 10 mph.. Partly cloudy during the evening followed by cloudy skies overnight. Low 36F. Winds WSW at 5 to 10 mph. Bighorn Reservoir crosses the Montana-Wyoming border in southeastern Montana. Controversy between lake and river users has highlighted operation of Yellowtail Dam for a decade. A fisherman shows off his catch in this file photo. In the wake of pressure from Bighorn River anglers, businesses, politicians and landowners, the Bureau of Reclamation has announced modifications to how it will operate Yellowtail Dam, as well as studies underway aimed at improving water inflow forecasts in the future. The BOR made the announcement at a Thursday meeting in Billings after an intensive 18-month scientific review that incorporated nine meetings with Bighorn River and reservoir users. 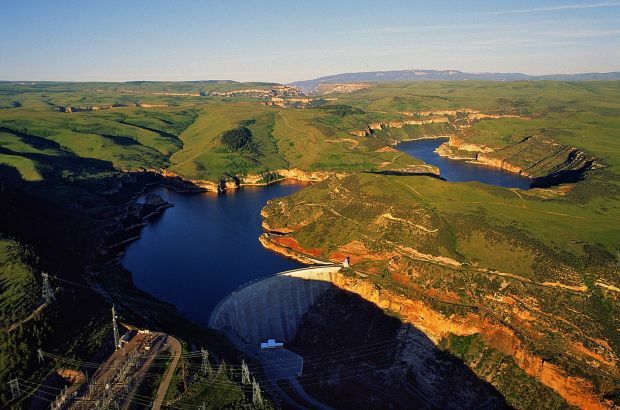 One of the findings of the Bureau of Reclamation’s review was that when the agency was forecasting water inflows — mostly based on snow melt — the old model was incorrect more than half the time. The error range should have fallen closer to about 20 percent. To resolve the issue the BOR is working to find a way to better calculate low elevation snowmelt and runoff — called enhanced resolution snowmelt modeling — that isn’t measured by sites that are only located in the mountains. With advance knowledge of early spring runoff the agency could draw down the reservoir sooner. The BOR is also testing out new software, the Pyforecast program, to see if it can improve forecasts. Bighorn Reservoir is a winding 70-mile long lake that straddles the Montana-Wyoming border while curving through the Crow Reservation and the Bighorn Canyon National Recreation Area. Yellowtail Dam, located just outside the Montana community of Fort Smith, was completed in 1967 to flood the canyon. Unfortunately for the agency the Bighorn drainage has had three of its biggest runoff years on record since a new operating criteria for the dam was initiated in 2010. The review concluded that such extreme weather events were impossible to forecast with current technology. “In really big water years you’re going to get big releases, there’s no way around that,” Lanini said. Doug Haacke, of the Magic City Fly Fishers, was one of the river users who had been critical of the BOR’s dam operation since 2010. Following the recent review and new recommendations he praised the agency’s work. While river users were somewhat appeased by the BOR’s work, reservoir advocates from Wyoming said they felt as though they got a bad deal, again. Former legislator Elaine Harvey, of Lovell, Wyoming, said farmers gave up river bottom land 60 years ago for the reservoir to be created with the promise that the community would benefit from increased recreation on the lake. “It will never be fair to the Wyoming side until we can have a full lake from Memorial Day to Labor Day,” she said. Keith Grant, a former county commissioner from Lovell, said the changes by the BOR have compromised trust the agency had built with Wyoming user groups. “I’m having a lot of trouble re-instating that trust,” he said, adding that he believes some BOR employees are prejudiced toward river-users’ interests. “I hope this new management system will work out and that the Bureau of Reclamation will be fair and balanced, but I’m concerned there’s too much bias,” he said. Anne Marie Emery, of the Bighorn River Alliance, countered that since 2010 the bias has been in favor of lake users to the detriment of river interests. Emery said she was “very, very pleased” with a list of 14 recommendations that the BOR unveiled to improve operations. More information on the BOR's study can be found online at https://www.usbr.gov/gp/mtao/yellowtail/bighorn_longterm.html.